Which time entry method should your organization use? Since cloud technology is now the norm with Human Capital Management (HCM) software, there are multiple ways to enable your employees to log their time. 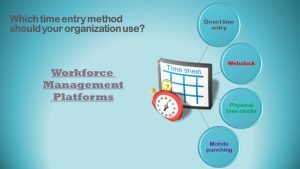 Most workforce management platforms in the marketplace today offer a wide range of time entry methods to support many different types of business requirements. Nonetheless, figuring out which method is best for your organization can still be challenging. From direct time entry, to time clocks, web clocks, and mobile, weighing the pros and cons can be tricky. Below are some of the highlights and trends that the HRchitect team is seeing in the HCM space. One of the simplest methods to set up and for end users to understand is direct time entry. Direct entry involves employees entering time right onto the timesheet within the time and attendance system, similar to a spreadsheet. This is widely the preferred method of entry for salary and exempt employees, as typically these groups tend to have simpler requirements for recording time, such as elapsed hours to charge against projects or simply exception time or time off. This is less common with hourly employees, since to pay hourly employees correctly, punch in/punch out times are required. Time collection methods tend to be stricter for hourly employee populations to ensure the accuracy of their hours. For employees that need to record in and out times, most workforce management systems offer an online “webclock” in the system as an alternative to physical time clocks, which we will cover next. Webclocks are a great solution for hourly employees who need to record in and out times but have access to a computer, as the webclock is accessed via a web browser, similar to accessing the timesheet or user home screen. One advantage of webclocks is that webclocks are a lot more cost effective than purchasing physical time clocks, while offering a lot of the same functionality, such as recording activity-based costing, transferring between jobs, punching in and out to meals, and recording the IP address of the webclock used for the punches. However, employees must log into the system with their username and password or via Single Sign-On (SSO) to access the webclock. As a result, this method is more tailored for desk employees with their own computers who need to record in and out times, and less of a portal for multiple employees to come and punch in/out at. Physical time clocks, also known as data collection devices, come in a variety of shapes and sizes and offer an array of functionality. The overall behavior is similar to the webclock, where employees can punch in and out and record activity-based costing, however physical time clocks can be mounted in places for easy access by multiple employees and offer quicker personnel identification than the webclock. Employees can punch in and out by typing an ID, swiping a badge, biometrics like fingerprint scanning, or other identification methods. This helps to make a single clock accessible to many employees in a short period of time. Certain models of data collection devices are even weatherproof for outside job sites where computers would not be practical. The newest form of time entry has emerged with the prevalence of smart phones and mobile devices. Mobile punching puts a form of a time clock at employee’s fingertips by allowing the employee to punch in and punch out on their own mobile device, while providing a lot of the functionality of the traditional webclock. This flexibility is a significant driver of mobile punching’s rise in popularity, especially for working populations that tend to be mobile or remote, where traditional time entry methods would not be practical. However, with added flexibility comes added risk. Employees can punch at any time and at any place, allowing for possibility of inaccurate start and stop times or even “buddy punching”, which is when one employee punches in or out for another employee who is not actually working late or coming in early. In order to prevent this, the device location can be recorded along with the punch for managers to review to make sure they don’t have 4 employees who work in different states punching in from one employee’s state/home location. Similarly, a geofence can be programmed to only allow punching within a specific geographic location. However, both options require the employee to allow for location services to be active on their device, which cannot be forced upon the employee when using their personal mobile device. So what does this all mean for those of you implementing a workforce management/time and attendance system? During implementation, a careful review of time entry methods for different groups of employees needs to be done. This is crucial to help determine which type(s) of time entry methods your organization needs to support accurate and efficient time entry. HRchitect has years of experience guiding companies to make the best choice for Human Capital Management systems and time entry methods that can support the employee populations within the organization. We help take the stress out of not only choosing a solution, but also implementing it. In addition to supporting the implementation, we can also lead the change management process, which is essential to ensuring your new time entry methods are rolled out seamlessly and effectively adopted for the long term. Nathan Meles is a Senior Implementation Consultant at HRchitect with over 6 years of experience with HCM technology. Nathan specializes in workforce management having previously worked as a support engineer and product manager for nuclear, fatigue management, compliance, Time & Attendance and reporting products at WorkForce Software.